It's the exciting news that we've all been waiting for! The Dixie Chicks MMXVI World Tour! 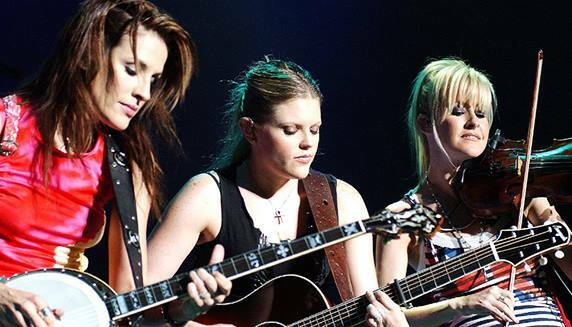 Dixie Chicks crafted a spot in the Country charts back in 1998 with their hit singles "There's Your Trouble" on their debut album, "Wide Open Spaces". Followed by 5 more gorgeous albums that included flawless cover versions, such as their famous take on the beautiful Fleetwood Mac "Landslide." Now, 26 years after their formation, Dixie Chicks are hitting the road on their biggest tour yet! Catch them at Farm Bureau Live on Wednesday 10th August 2016! Boasting with heart-wearming three-part harmonies and multi-instrumental talent, it's no surprise that the Bluegrass four-piece, Dixie Chicks became one of the most popular acts in contemporary country music! Their incredible career of 26 years is packed with gorgeous melody driven hits that gained impressive recognition. Including; 13 Grammy Awards, including five in 2007 for Taking the Long Way – which received the Grammy Award for Album of the Year – and "Not Ready to Make Nice", a single from that album. With 30.5 million certified albums and 27.4 million albums sold in the US alone! With this unbelievable success the Dixie Chicks are now the highest-selling female group in America.